They’re sweaty, they’re chubby and they love pushing each other around. But enough about the folks at my family reunion, let’s talk about sumo. 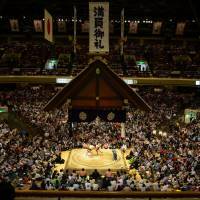 This quintessentially Japanese sport is a lot of fun to witness with kids, and the Ryogoku neighborhood surrounding Tokyo’s Kokugikan sumo stadium has several other places worth visiting, too. 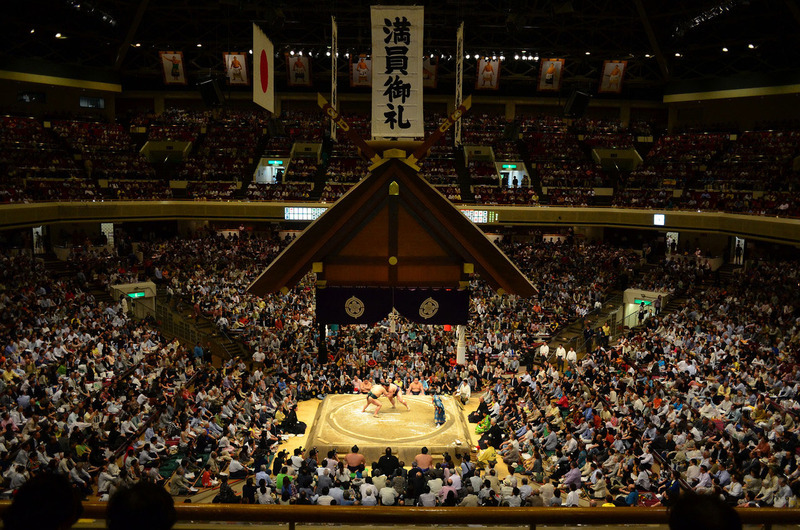 Each sumo tournament lasts two weeks, and the next one in Tokyo starts Sept. 15. Tickets cost upward of ¥10,000 to sit near the dohyō (sumo arena), but I prefer the general admission section. These are the cheapest seats in the house — the very last row where the stairs meet the ceiling — and tickets are just ¥2,100 for adults and ¥200 for kids (under 4 is free). But are the closer seats worth it? Perhaps, but the Kokugikan isn’t a big place, and even the back row offers a decent view. Sumo wrestlers are big, remember, and you can still hear the slap of flesh on flesh and make out their facial expressions when they get a stray forearm to the neck. My daughter brought along a pair of cheap plastic binoculars to admire the detail in their kesho-mawashi (ornamental loincloths). But while binoculars are a nice bonus, they are not required to enjoy yourself. The only downside to the cheap seats is that large groups may not be able to sit together, unless on a weekday. General admission is inexpensive, but not easy to come by. During the last tournament, I went to buy tickets three (three!) times, and returned home empty-handed because they had sold out. Only when I arrived very early did I earn my prize. On the last weekend of the tournament, I showed up at the Kokugikan at 6 a.m. — the ticket gate opens at 7 a.m. There were around 40 sleepy-looking souls already in line. By the time my wife and kids arrived an hour later (everyone must be present to get these tickets), the line snaked around the block. If you do choose the cheap-seat route, I recommend going early, getting your tickets and then eating breakfast somewhere nearby. 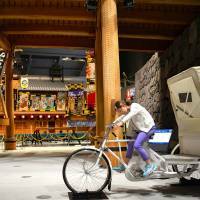 After breakfast, head to the Edo Tokyo Museum, which opens at 9 a.m, just around the corner from the sumo stadium. The hundreds of artifacts found within chronicle the story of Japan’s capital in ways everyone can enjoy. Miniature models portray ancient boats and architecture, while mechanical dioramas show life on the streets and in the state houses of the past. 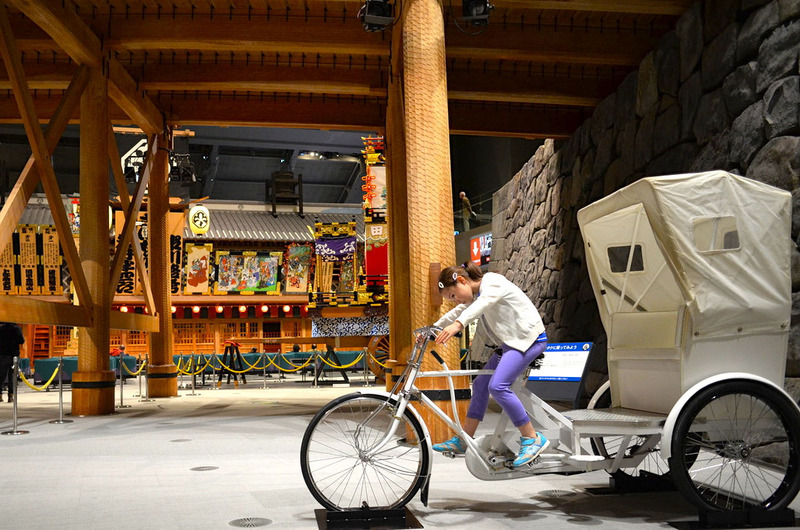 A full-size kabuki stage and portable shrine sit in the cavernous main hall, and sedan chairs, rickshaws and bicycles from various eras can be climbed onto or into for snapshots. About a five-minute walk from the museum is Ekō-in Shrine, home to a stone talisman honoring Nezumikozo, a thief who is often called Japan’s Robin Hood because he robbed from the rich and gave to the poor. Many people come here to scrape and sprinkle the stone talisman’s dust into their wallets for good luck. This is also the location of an interesting pet cemetery. Bronze statues of a dog and two cats are festooned with fresh flowers, and inside a small mausoleum are the pictures of dearly departed furry friends, often with their owners burning incense nearby. I know what you’re thinking: and yes, pet cemeteries aren’t for everyone, but I once discovered it to be an easy way to talk about a heavy, existential subject with a 7-year-old without inflicting dread or boredom. Just a suggestion. OK, enough morbid stuff. On to the tournament! Some days, the sumo starts as early as 8:40 a.m., but if you go that early, you’ll be watching teenagers with crew-cuts slapping each other around in a near-empty arena. You’re allowed to leave and reenter the Kokogikan once, so check out the early matches if you care to, but the bouts with wrestlers worth watching start after lunchtime. I’ll be honest: I wasn’t sure if my kids would enjoy this highly ritualized spectacle — all that posturing for bouts that last mere seconds. I’m pleased to report that both my elementary-school-aged kids were fascinated, as were other young spectators I saw sprinkled throughout the crowd. The short, strenuous fights were a natural fit for short attention spans, and all the pauses and false starts preceding each bout built a palpable tension my kids responded to. In fact, they eventually followed the lead of nearby fans and began shouting the names of the rikishi (wrestlers) moments before battle, although my brood seemed to choose who to root for based on the color of their fundoshi (loincloth). During a bathroom run, my daughter and I stumbled upon the trophy case, and spent nearly 20 minutes with our noses to the glass admiring each massive object: ornate ceramic vases, a huge jar filled with plums, and a variety of gold and silver bowls. My daughter’s favorite was the main trophy: a two-handled chalice larger and heavier than she is. We returned in time to watch the final half-dozen bouts (it’s all over by 5:30 or 6 p.m.), and then stomachs began to grumble. For dinner we headed to Hananomai, a sumo-themed restaurant right next to Ryogoku Station with good izakaya (pub) fare in an atmospheric old-style beer hall. If you want to go, however, arrive soon after the last bout or you may have to wait for a table. There is even a dohyō in the restaurant’s main room where you often find men singing traditional songs for tips — a nice way to end a day where sumo was the main attraction. Sumo Info in English: www.sumo.or.jp/en/index. Sumo-themed restaurant Hananomai: www.chimney.co.jp/event/ooedo808/index2_ec.html. Edo Tokyo Museum: www.edo-tokyo-museum.or.jp/english/. Ekō-in: en.wikipedia.org/wiki/Eko-in.